Gastric cancer is still a common cause of cancer-related deaths worldwide and often diagnosed at an advanced stage. Per the American Cancer Society (ACS) approximately 1 in 111 people may develop gastric cancer, the third primary cause of cancer mortality in the world. The MKN-45 cell line was established in Japan from a poorly differentiated adenocarcinoma of a 62-year-old woman. The MKN-45 cell line expresses wild-type p53 protein and is characterized by amplification of c-met oncogene and promoter mutation of E-cadherin. Preclinical murine models of gastric cancer help researchers to evaluate management strategies for stomach cancer. A 2011 study published in Clinical Cancer Research, tested the antitumor activity of the PI3K/mTOR kinase inhibitor BEZ235 against gastric cancer both in vitro and in vivo. The article indicates that the MKN-45 xenograft model is resistant to treatment with BEZ235 in vivo. The 2013 study by Lio et al. characterized the MKN-45 cell line cultured in enriched medium and identified spheroid body-forming cells as well as overexpression of cancer stem cell (CSC) markers (CD44, Nanog, Oct4, Sox2). Identifying CSCs, which possess properties that contribute to tumor formation, metastasis and recurrence, in gastric cancer models is considered important for developing stem cell-targeting therapies. A 2012 study by Yamashita-Kashima et al. (2012) used MKN-45 cells to look for biomarkers indicative of anticancer activity of bevacizumab, a monoclonal antibody against human endothelial cell growth factor (VEGF) used for chemotherapy. The group concluded that VEGF levels and VEGF/bFGF ratios were most correlated to bevacizumab sensitivity but that other predictive markers are needed for this model. The last example study using MKN45 cells is the 2010 study by Chong et al. which screened for biomarkers of gastric tumor growth and found that in the MKN45 xenograft model reduced plasma levels of human APOA1 correlated to tumor size. This has potential clinical relevance in terms of tumor detection. The MKN-45 cell line is used to create the CDX (Cell Line Derived Xenograft) MKN-45 xenograft mouse model. 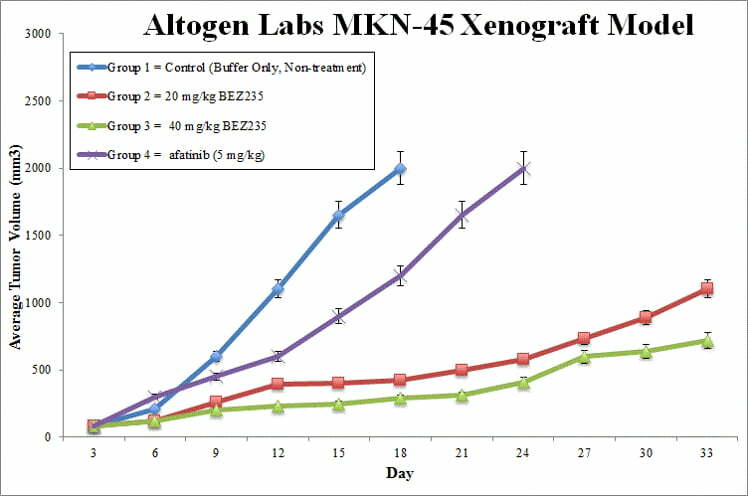 The MKN-45 xenograft model is also resistant to TGF-B growth inhibition, carboplatin, docetaxel and irinotecan. However, there is anti-tumor activity as evident from afatinib and BEX235. Exponentially growing MKN-45 cells are collected and cell viability is determined utilizing trypan blue. The concentration of the cell suspension is adjusted to the appropriate density. Athymic BALB/C or NOD/SCID mice (10 to 12 w.o.) receive single, subcutaneous injection of one million cells (vol of 100 microliters with matrigel). Tumor growth is measured by calipering until an average size of 50-150 mm3is reached. Animals are then randomized to form the treatment cohorts. The test compound is administered according to the client supplied treatment schedule. Tumor sizes are measured daily. Animals are euthanized as tumor size reaches 2,000 cu millimeters. A final necropsy and tissue collection is performed. Tumors are excised from the animals and weighed. Optional digital imaging of tumors is available. Standard gross necropsies are completed; tissues are collected for downstream analysis.